In 2018, Baleària carried 4,320,000 passengers (+11%) and 1,209,000 vehicles (17%) on its 23 routes with a total of 1,109,000 on its five international routes. “The foreign market now accounts for 22% of the Baleària group's overall figures,” explained its president, Adolfo Utor, at a press conference this morning. On these lines, passenger growth was 26% while sales exceeded 84 million euros (16% more). Half of the group's passengers (2,277,000) travelled the lines connecting the Iberian Peninsula to northern Africa (Morocco, Algeria, Ceuta and Melilla); thus, northern Africa is the area where the Valencia-based shipping company is growing the most. With respect to cargo, which accounts for half of Baleària's business, Utor indicated that growth was 3.5% (5,800,000 linear metres of goods carried). “Cargo is currently concentrated in the Balearic Islands with 79% of the total but it's a very mature market meaning growth comes from the rest of the routes,” Utor said. He also underlined the cargo port's operational digitization. “We're at a time of expansion as we also consolidate new routes on the Alboran Sea and around the Canary Islands,” mentioned Utor in reference to the lines created in 2018 through strategic alliances with the shipping companies Marítima Peregar and Fred Olsen. Express which “strengthen Baleària's strategic position in the market with a more comprehensive and solvent offer.” The high cost of the implementation of the new routes, which must be reinforced, along with the increased price of fuel in 2018 have caused profitability and, thus, the final results to drop according to Utor. So, in spite of the shipping company bringing in €381,400,000 (5% more), EBITDA was 14% lower (€70,300,000) and the net profit was 37% less (€27,400,000). Moreover, Utor predicted this trend would remain steady this financial year while new traffic routes are consolidated and the planned ship engine refittings are completed as they are currently inactive. Utor emphasized “the express will that Baleària's economic growth be sustainable and, therefore, compatible with environmental preservation, social inclusion and equal opportunities”. With all of its projects, the company seeks “competitiveness without forgetting these criteria,” he said. As an example, he mentioned the use of liquified natural gas which in 2018 was “Baleària's contribution to the fight against climate change”. “Natural gas is a cleaner energy which goes hand in hand at Baleària with digitization. They are two strategic lines that perfectly combine in our smart ships,” mentioned Utor. By the end of 2020, Baleària will have nine gas-propelled smart ships, three of which will be newly-built and six of which are already in its fleet, but will have new engines (partially funded by the EU). Thus, the Hypatia de Alejandría, which was finished in 2018, and the Nápoles, the engine change for which began that same year, have made the use of natural gas at Baleària a reality. “We're pioneers in the Mediterranean and in the Canary Islands on the use of this less contaminating energy but also internationally with the construction of the first fast ferry in the world to sail with LNG engines,” underlined Utor. As concerns the environment, the shipping company's president indicated that “Baleària's sailing in 2018 was more eco-efficient” as the miles sailed by the fleet increased by 13% yet its CO2 emissions only rose by 6.5%. As far as the four eco fast ferries added to the Eivissa-Formentera route in 2018, it's worth highlighting that the ratio of CO2 emissions per mile dropped by 36% in comparison to the fleet operating previously. The social cash flow, or value distributed to stakeholders, increased to €506,849,000 for 31% growth. On the one hand, Baleària contributed to job growth in 2018 as its team increased by 9.4% to total 1,600 employees and personnel expenses rose by 17.7%. One out of every four employees is foreign and the staff is comprised of 55 different nationalities. “In 2018, we invested 15% more in training our team which improved the professional performance evaluation results collected annually,” explained Utor. The company's stakeholders also include customers (97.2% say they would travel with the company again, rating it at 8.1) and suppliers, which are 80.9% local. This demonstrates the “huge impact Baleària has on the territories where it operates,” said its president. 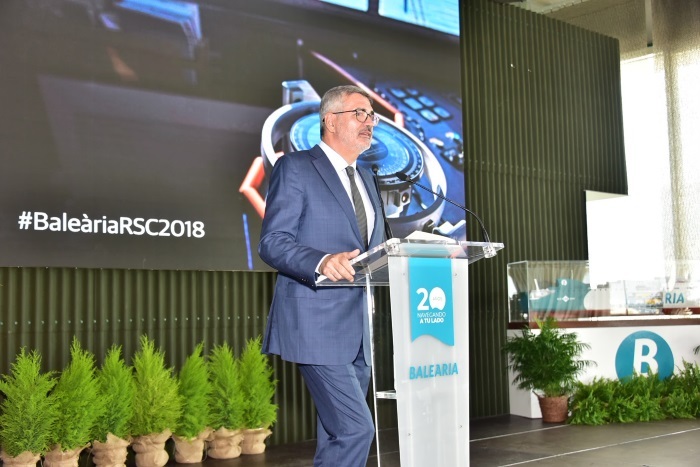 Finally, the president of Baleària recalled that “Baleària's commitment is long-term and runs along the lines of innovation and sustainable growth.” He also pointed out that the shipping company's most immediate challenges are changing towards a digital culture “to continue leading in the use of natural gas and smart technologies,” which is why Baleària is updating its fleet “to offer passengers a more experiential trip”.